Whatever you seek on your visit to the Isle of Wight you are unlikely to be disappointed and Waverley Park Holiday Centre is ideally located to offer you the widest possible choice of experience. Conveniently situated close to mainland ferry connections and local bus routes it is within easy walking distance of Osborne House, Queen Victoria’s home on the Island and English Heritages second most visited site and to the bustling yachting centre of Cowes popular all year round whose quaint pedestrianised main street boasts many shops, pubs, cafés and restaurants. Despite all this Waverley Park still manages to maintain a sense of being “off the beaten track”. The original house which dates from 1795 is set in 12 acres of gently sloping grounds is surrounded by mature trees and commands panoramic views of the many shipping routes and leisure craft in the Solent and Cowes Harbour. The well maintained grounds have areas which are left to nature ensuring an abundance of wildlife and gaining Gold awards from both David Bellamy and Green Island. A gate at the foot of the site gives access to the unspoilt esplanade, popular for fishing, sailing, crabbing and water sports. At Waverley Park you can enjoy your stay in one of our modern caravans or in our well appointed and comfortably furnished holiday flats. Parking is adjacent in most cases. You can visit with your own touring caravan, motor home or tent either on our generous, level, terraced and fully serviced pitches or choose a grass with or without full services. From late May until mid September the licensed club house and its sun terrace are open every evening for meals, bar and family activities or live music. 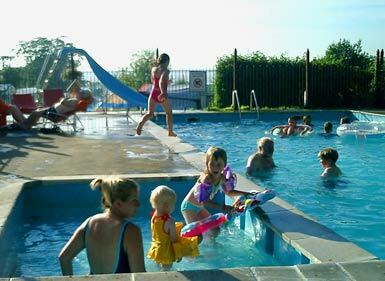 The heated outdoor pool is open all day at this time of year. Young and old alike are welcome to join in or simply relax on the terrace and watch the cruise ships sailing from Southampton and our famous blazing sunsets. The terrace overlooks the children’s play area and provides parents with an ideal spot to watch their children safely playing. The Games room and table tennis room are also connected to the club house. As a ‘hands on’ family business it is our aim to offer the best possible to our visitors in all respects, whether they want to socialize or simply seek a relaxing escape.